Great pictures Dave. So interesting to study and see the cars, trucks, buildings and people, signs. 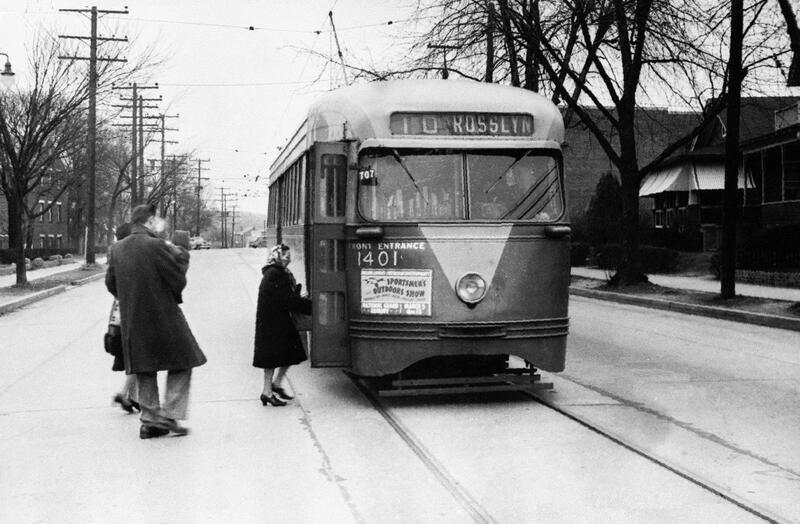 Now if we could just go back for an afternoon, stop at every corner store, but as many 10 cent comic books as we could and keep doing that while riding the streetcar we could retire millionaires. 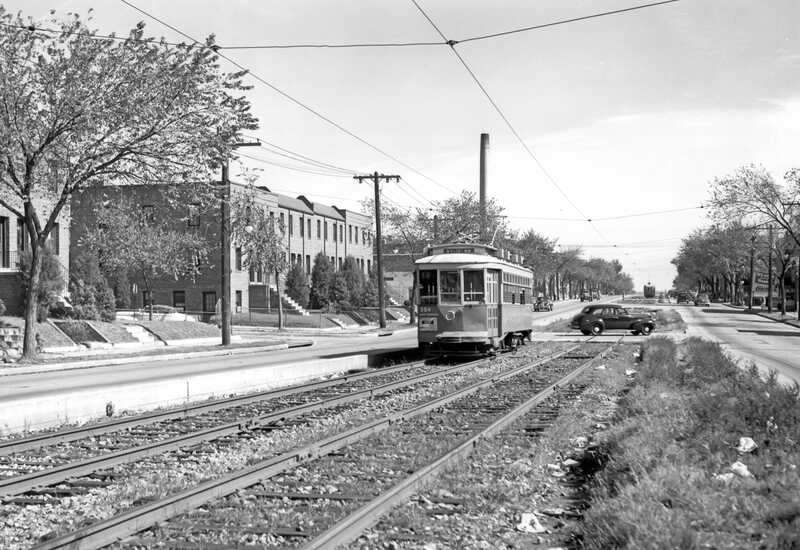 Seat Pleasant was where the WB&A connected to the WRy&E lines. The line there predated the WB&A. 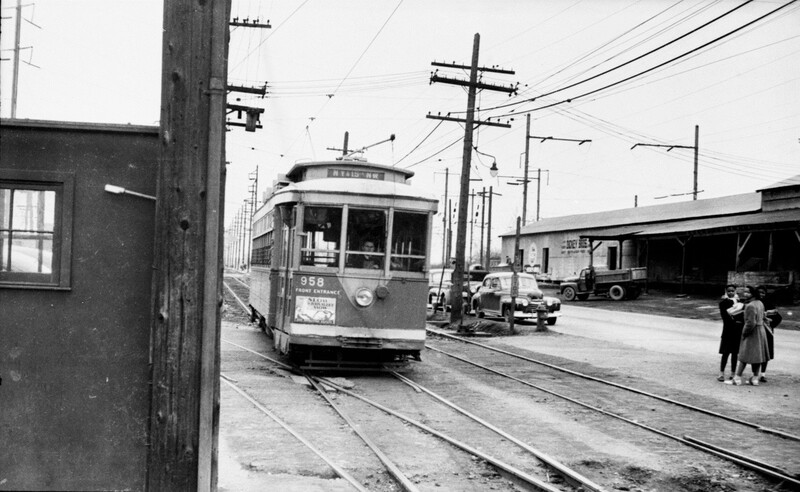 Until the WB&A re-electrified with DC, WB&A trains terminated at a station called White House, near the WRy&E Columbia barn on Benning Road. 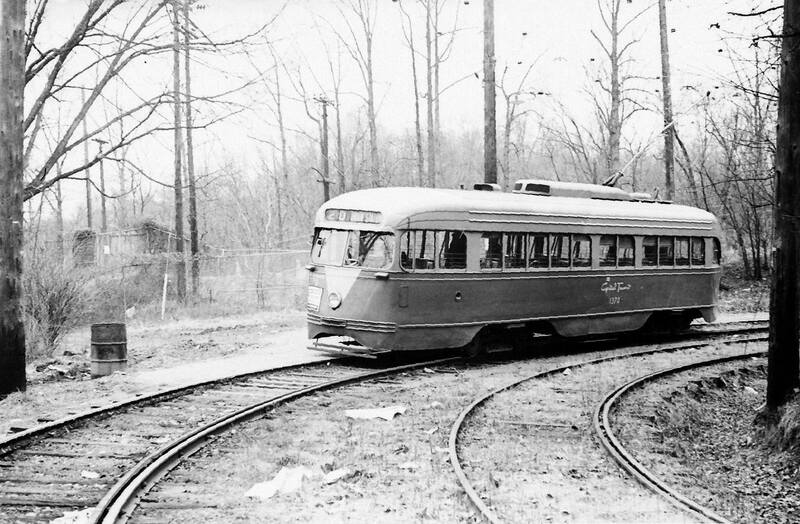 Steam dummy trains of the Chesapeake Beach RR also used Seat Pleasant. 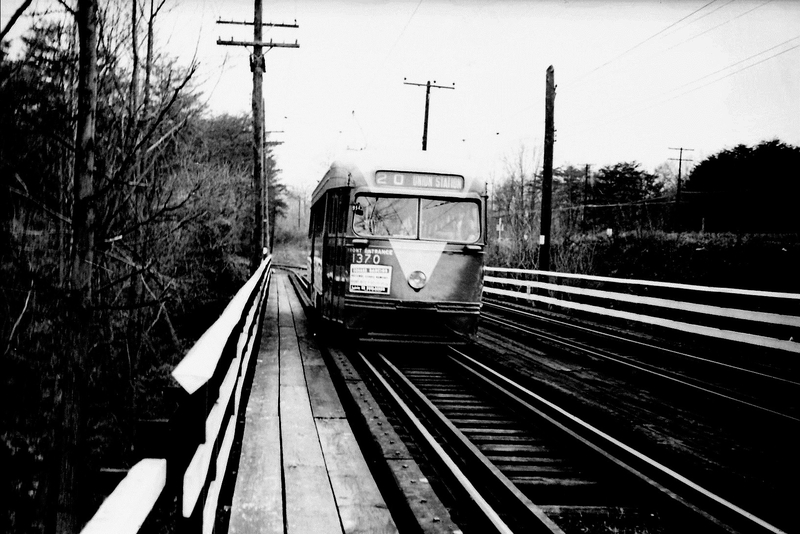 The CB RR's later electrified suburban service may be what Dave's informants remembered. 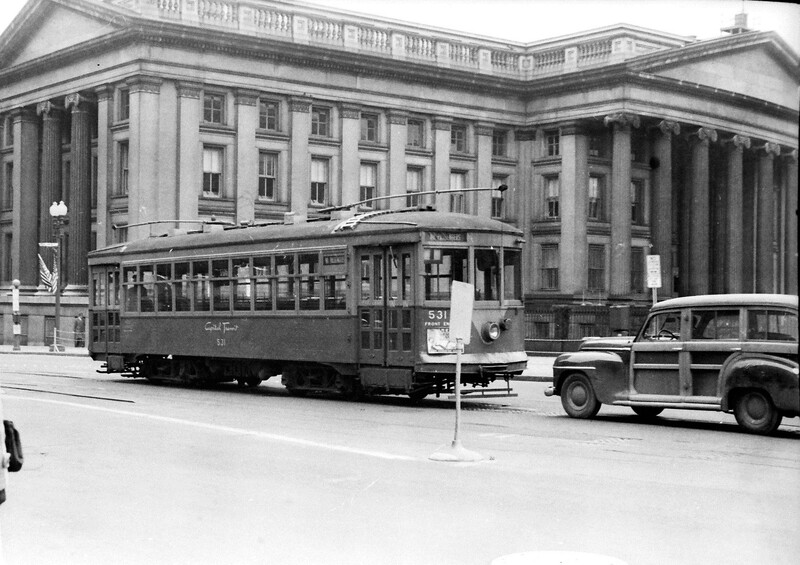 The original AC cars were equipped to carry plows, but were too heavy for conduit track. 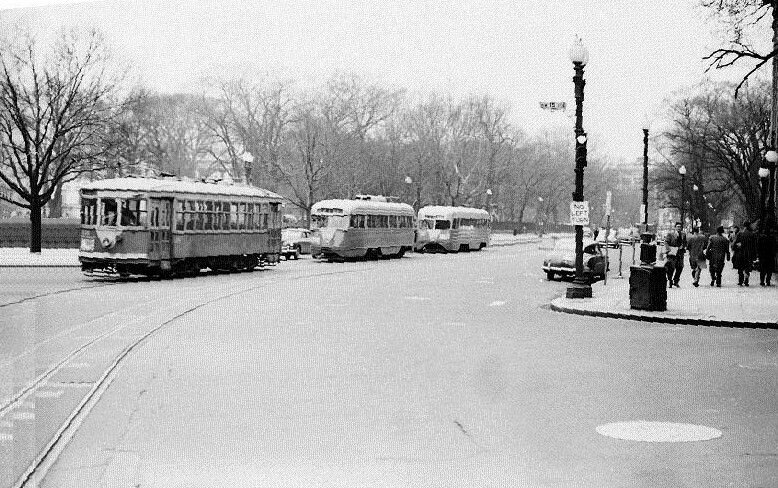 Even after new, lighter 1200V DC cars went into service in 1909, WB&A had to pay a substantial amount to strengthen the streetcar tracks west of White House to the Treasury building (near the real White House). 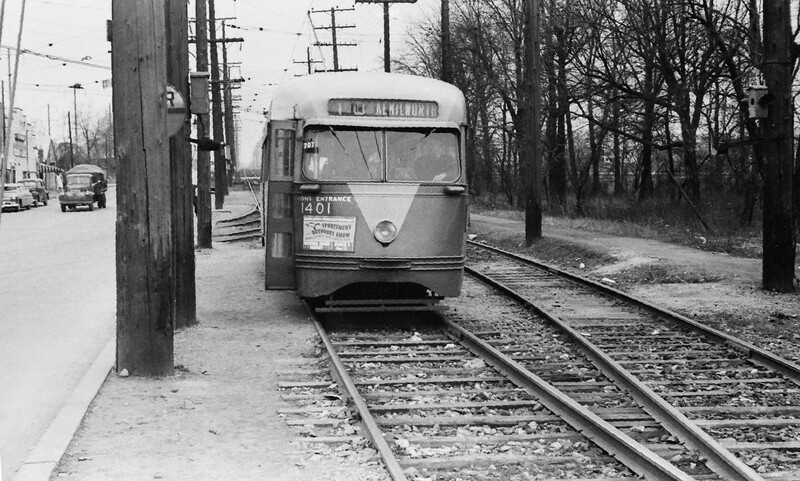 Both AC and DC cars were equipped with two trolley poles on each end, used on WRy&E's 600V DC double wire from Seat Pleasant to the Columbia barn plow pit, as well as WB&A's own 750V AC street trackage in Annapolis, made single after conversion to 1200V DC. Cool. 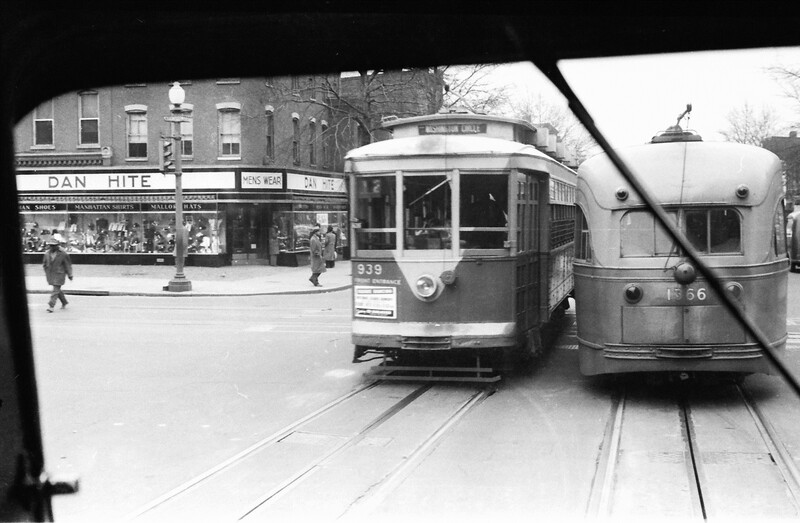 I used to ride the DC streetcars, mostly around downtown, and up and down Georgia Avenue. 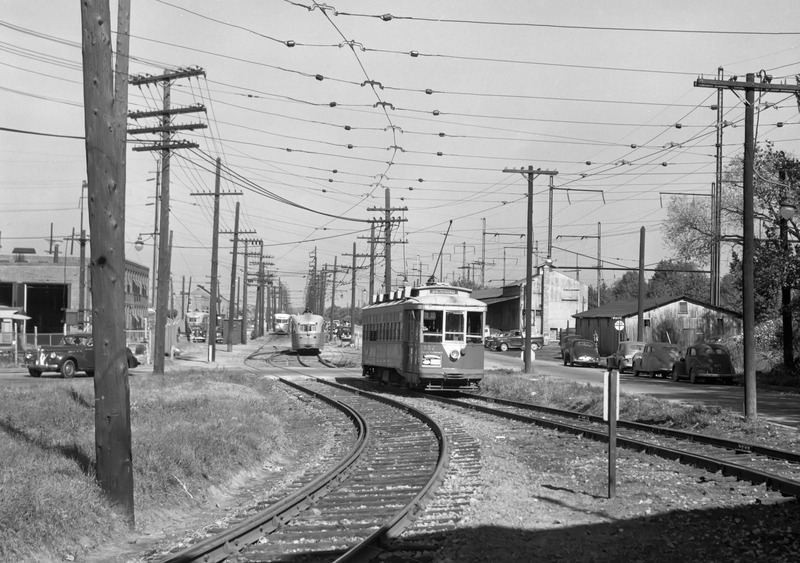 I dimly recall the car stopped near the DC line to change from underground power pickup to catenary. 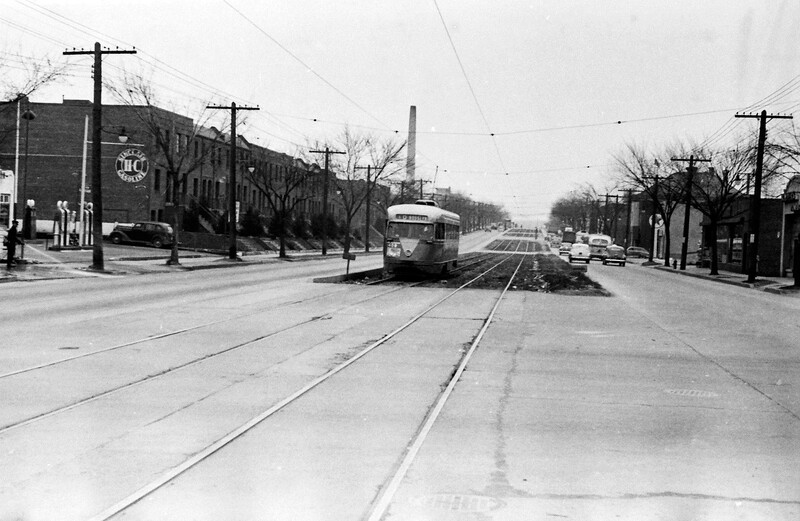 I seem to recall this as south of Walter Reed. 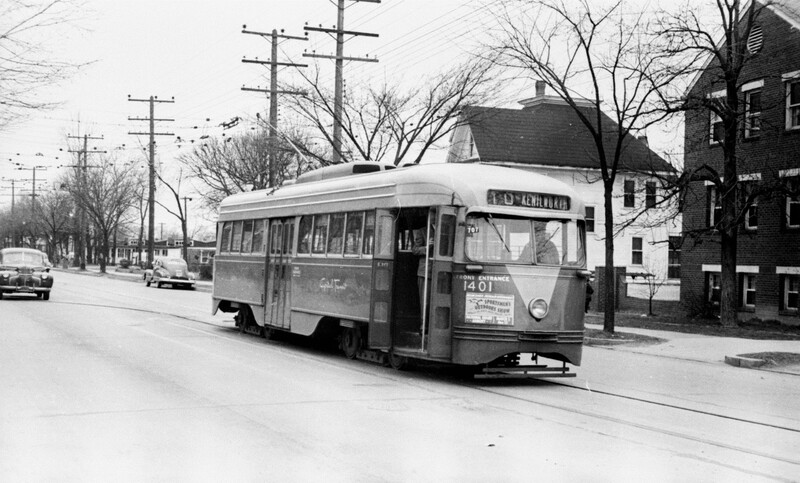 But this was over 60 yers ago. 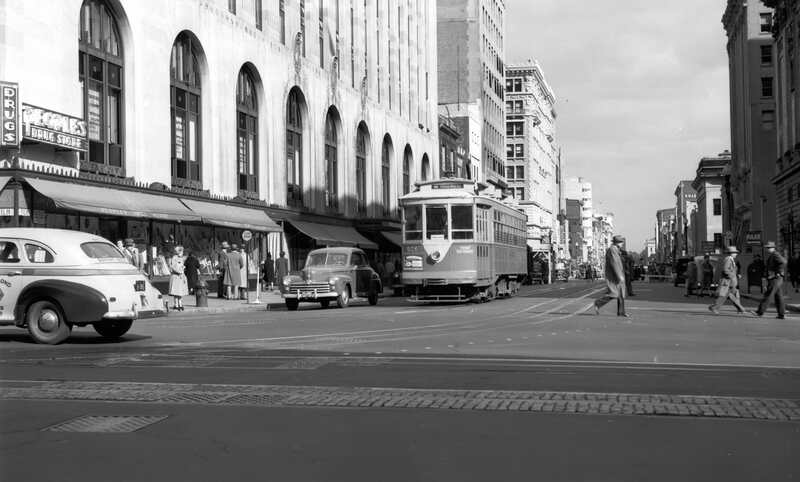 There are still some remnant curbs downtown out in the street where the tracks went down the middle of the road. Sure wish I had the edit button, so I could simply erase the kind of mistake so easy to make on the previous posting. If the moderator won't let me do it by using an edit button, perhaps he can correct the error? 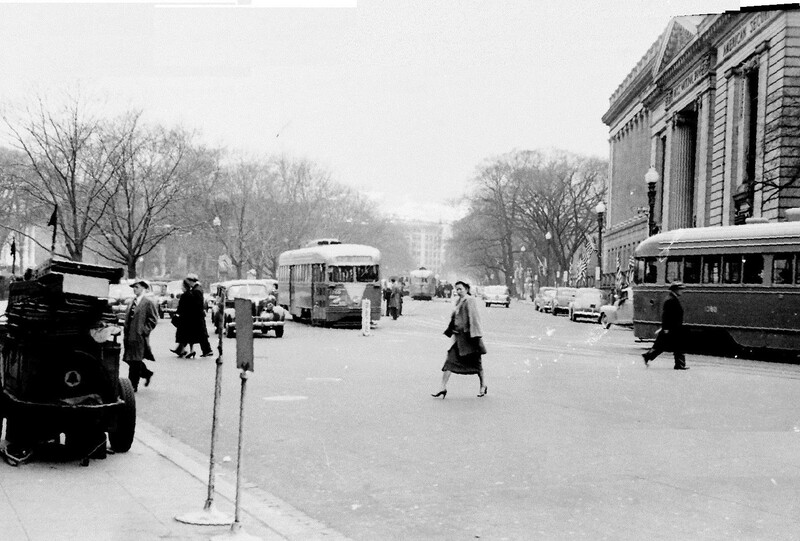 The previous photos were on Pennsylvania Avenue, not far from the White House. 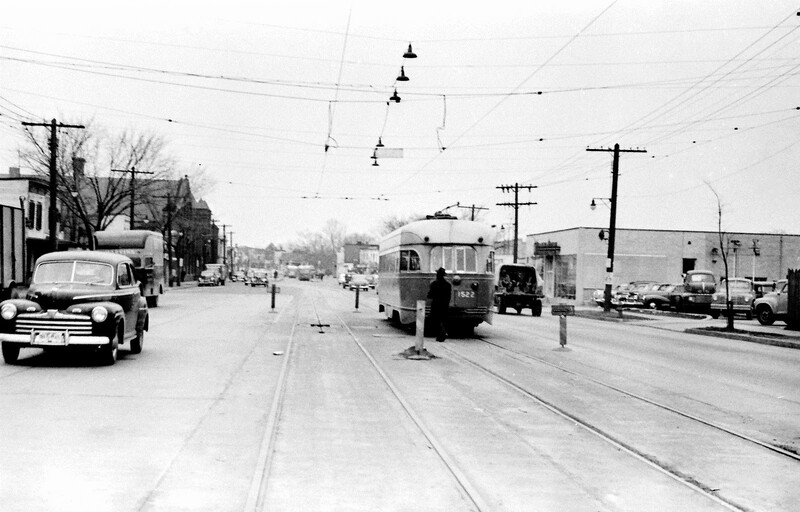 I found another good Benning Road photo, loated at the transition from paved track to center-reservation. Neat pictures David! 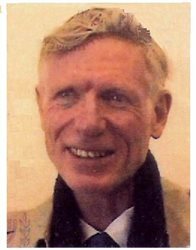 Do you have any idea how much maintanance that conduit system took? 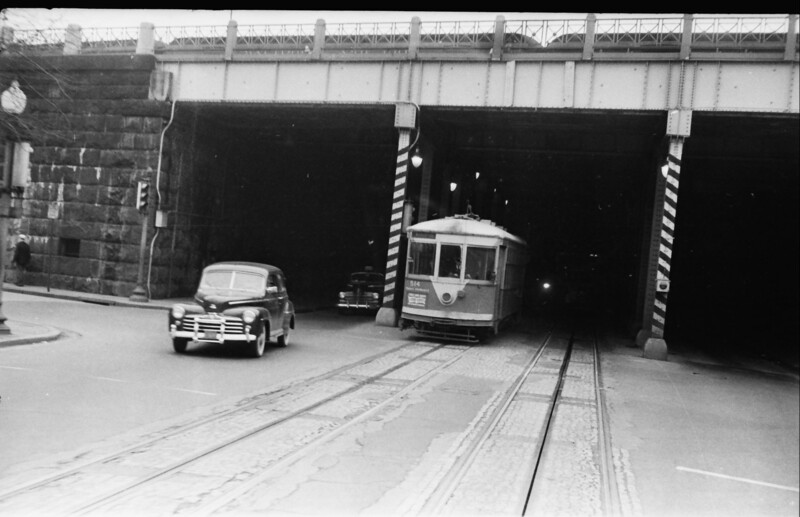 It seems to me that being below street level it must have been prone to flooding, icing, snow build-up, and who knows what kind of foreign matter, to say nothing of corrosion from road salt. It must have been a nightmare at times. Maintaining the conduit was a nightly occupation. 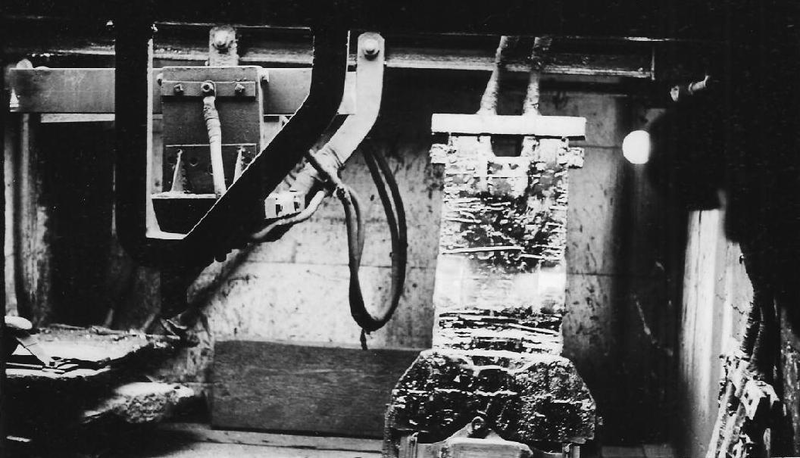 In Manhattan, one piece of work equipment was a slot-cleaner that scooped up trash that had fallen into the slot, and which would then fall between the two contact rails, which were considerably futher apart tha the slot width, sort of a larger but thinner version of a water scoopr for trackpans on a steam locomotive tender. In Manhatan, this ca ran every evening, and I assume all slots were cleaned every other day. Salted snow could short the system and on occasoin did so. 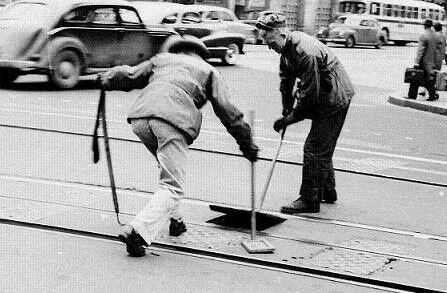 But in general, streets with conduit track were not salted, exept by mistake. Dave, I wonder: what material was used in the making of the scoops? 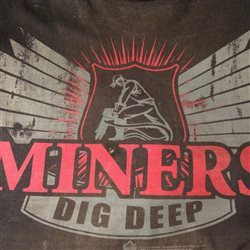 I am sure that it was non-conductive and was of some material that resisted the wearing. Thanks for that response David, I knew about the conduit system and always wondered just how much effort it took to keep it going. Looks like it was quite a bit. 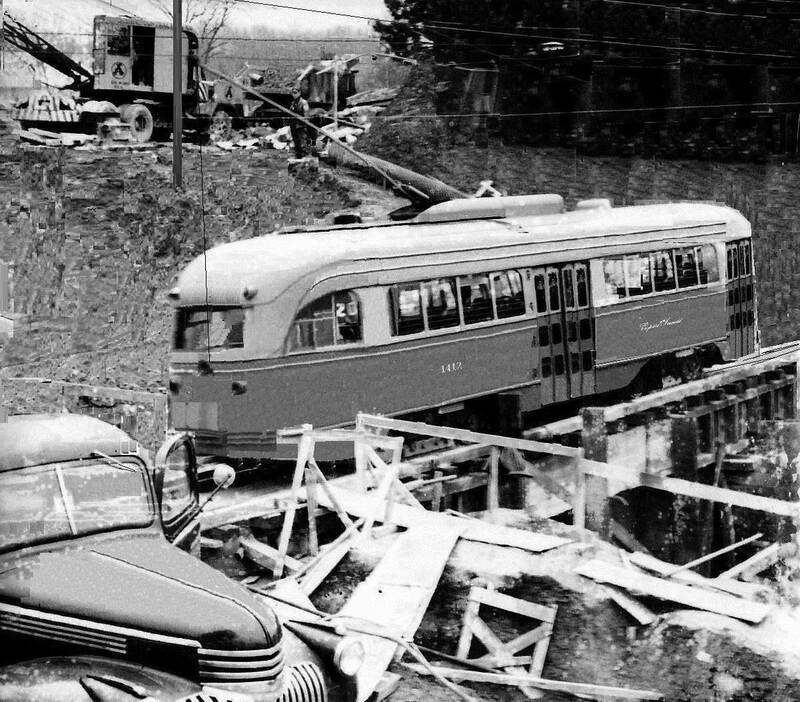 Like the conduit plows, see the photo of one in a plow-pit, wood, shellacked to avoid moisure penetration, The scoop could not really transfer much garbage into the slot-cleaner car, but pushed most of it along the channel under the two contact rails. 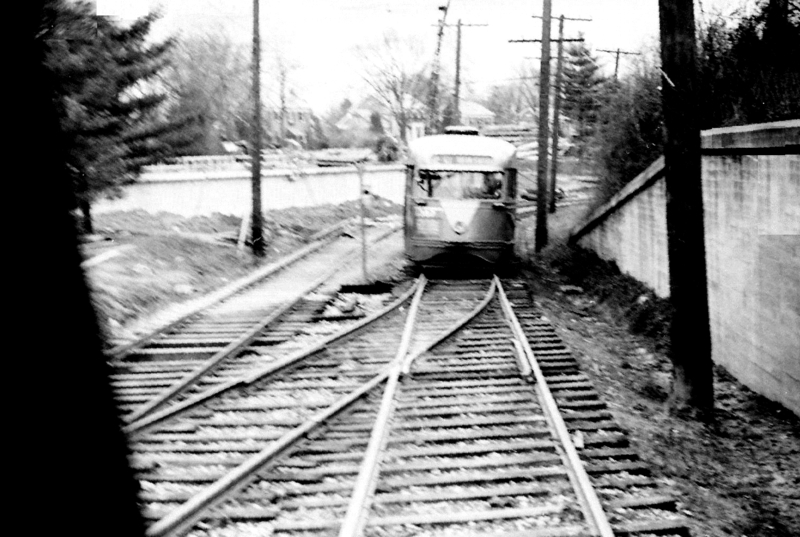 About every half-mile, the slot-cleaner would stop, reverse half a car-length, and two workmen would open the two manhole covers each side of the slot and use wood shovels to get the accumulation out of the channel. All this was 1-5AM stuff. 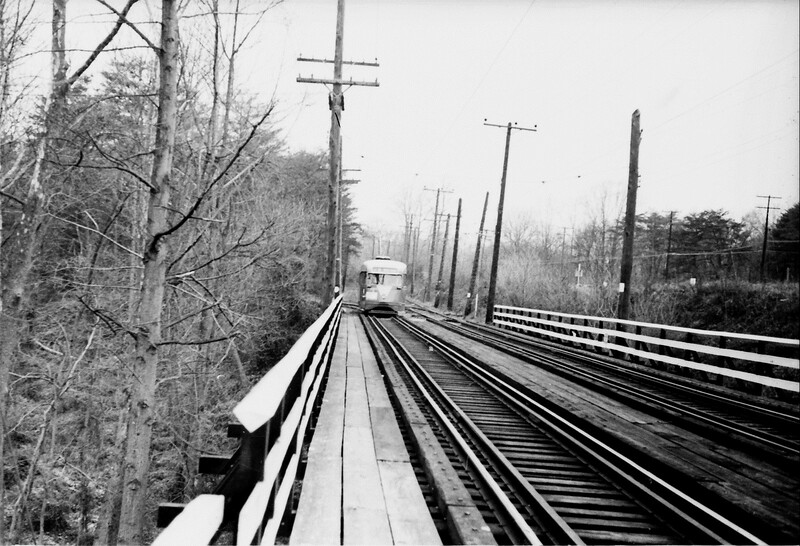 This photo, redently "revived," is imporant because it shows Capitol Transit maintaing streetcar service on the Cabin John line when a typical authority would substitue buses during the construction period and not install a temporary bridge with single-track operation. 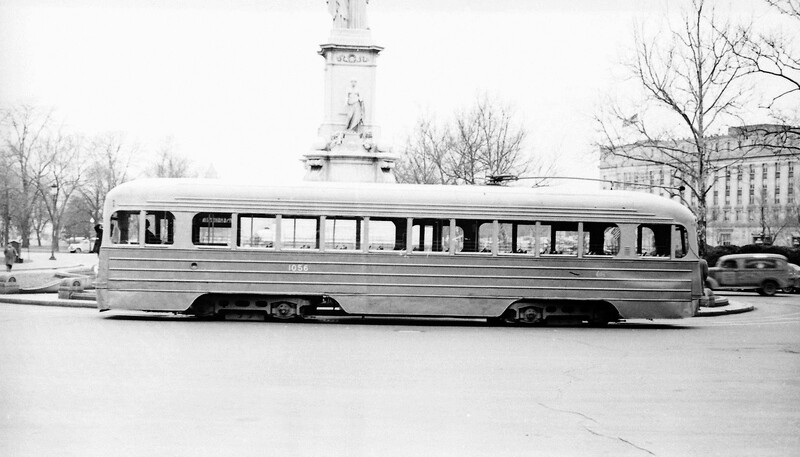 Found this on the web, the streetcar had whitewall wheels and was caring the prewar livery On another web site it stated that the prewar livery of DC streetcar was simplified because of the World War II. 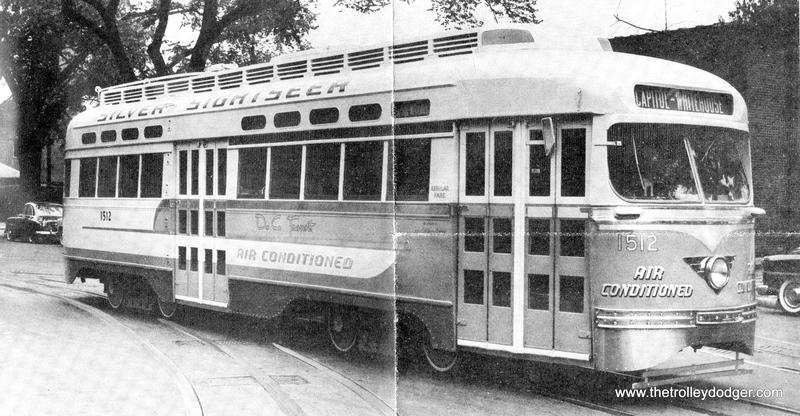 This was the "Silver Sightseer," Capitol Transit's only air-conditioned streetcar. 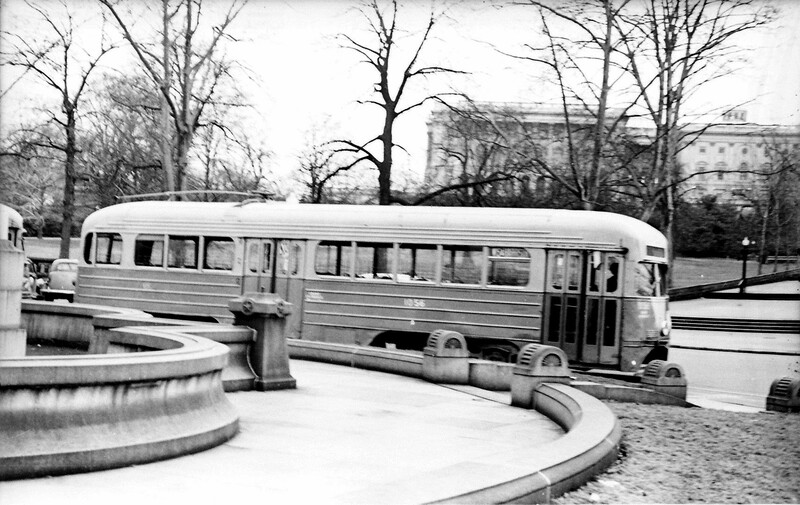 It was saved in running condition at the Capitol Trolley Musum butseverly damged in a carbarn fire. 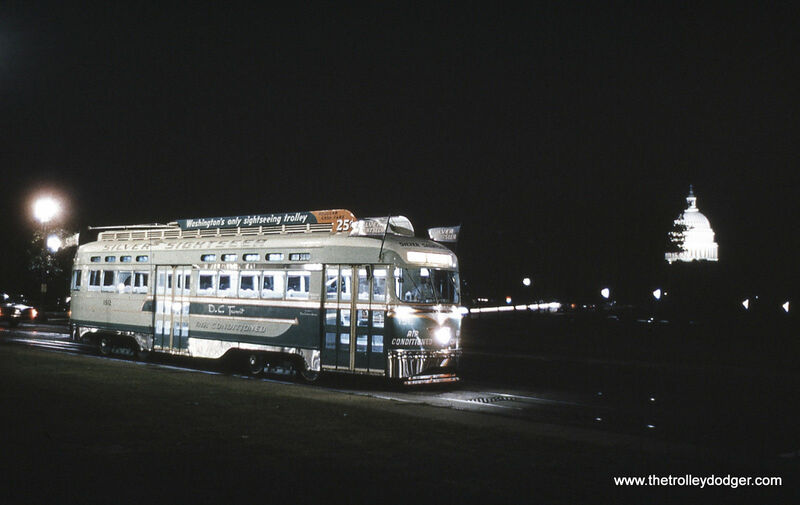 Too bad that this beautiful trolley had such fate. I think, given enough money, it could be restored. The damaged body has not been scrapped, as far as I know. 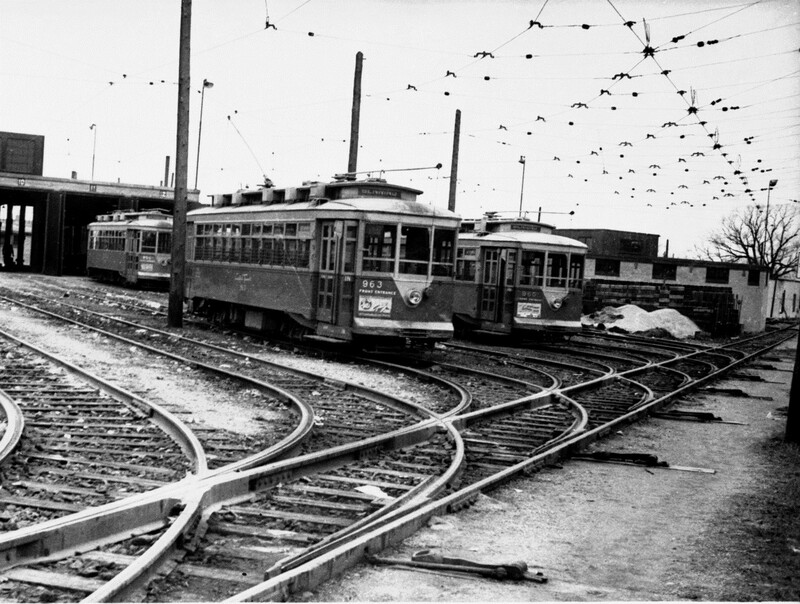 But it would be much less expensive to buy one of the near-complete MUNI PCCs being put up for sale as beyond their requirements, and have Brookfield restore and rebuild it into a duplicate. 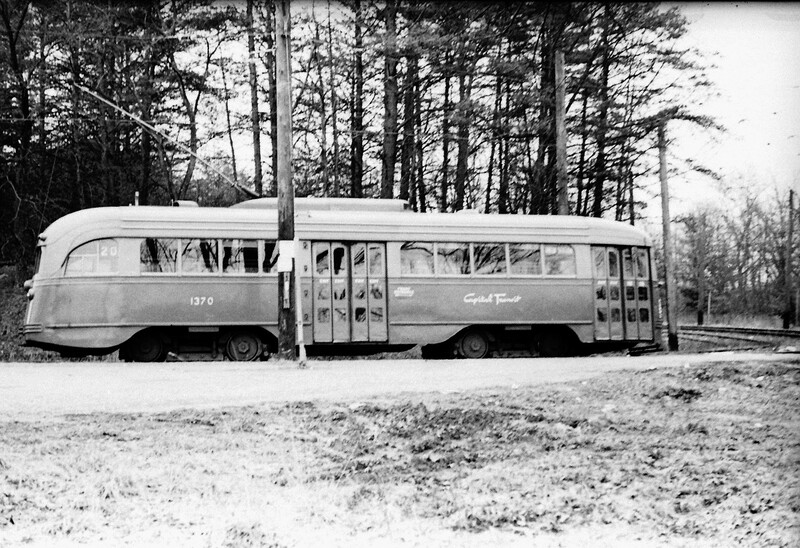 Anyone know what Capitol Trolley Museum's current plans for this are? 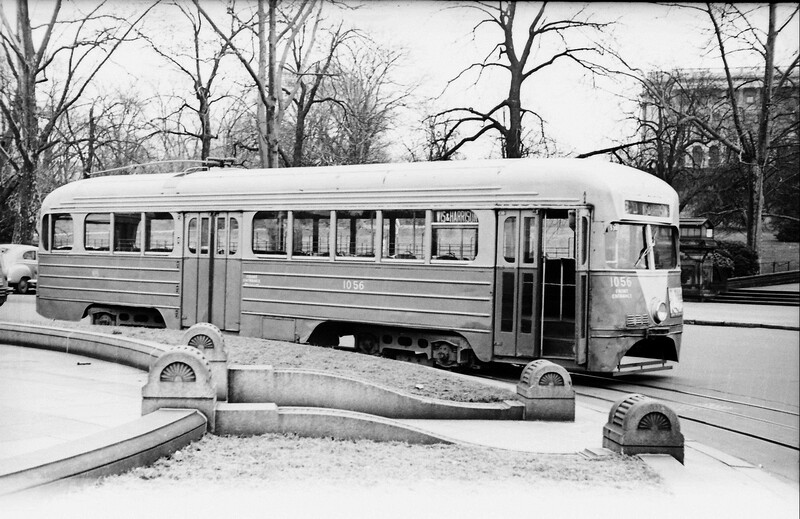 I found a stories about the Silver Sightseer after the fire, please take a look if you like. 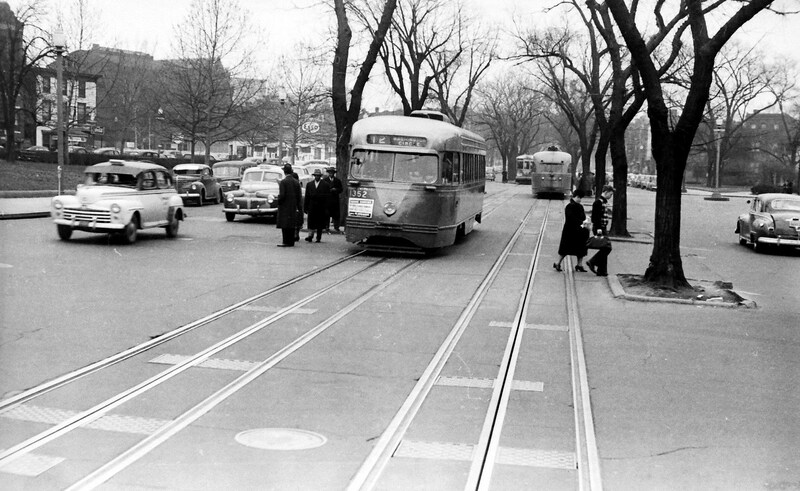 A great read: 100 Years of Capitol Traction:The Story of Streetcars in the Nation's Capitol. 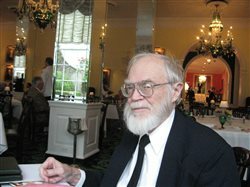 Leroy O. King, Jr. c.1972 Taylor Publishing Co., Dallas, TX. Jones.....thanks for the information. sorry to hear the car was lost. Othr museums and historic operations should take note. when a member starts saying he hates any part of the collection, he should be watched closely and not permitted free access anymore. Please spread the word. Important!!!! My pleasure, Dave. I have seen some private owned museums haired enough security guard to protect their collections, but many smaller museums are vulnerable. Not to be critical of small museums but times as hard as they are today, before equipment gets stolen or vandalized, such museums should seriously consider shutting down and donating same to larger ones where all will be safe for everyone to enjoy. Another advantage: Equipment will get properly restored. Many pieces now sitting in small museums across the nation are in grave danger of getting scrapped due to improper funding. Richard Allman sent me these Ed Miller photos, beginning with Ed himself at the controls of a PCC. 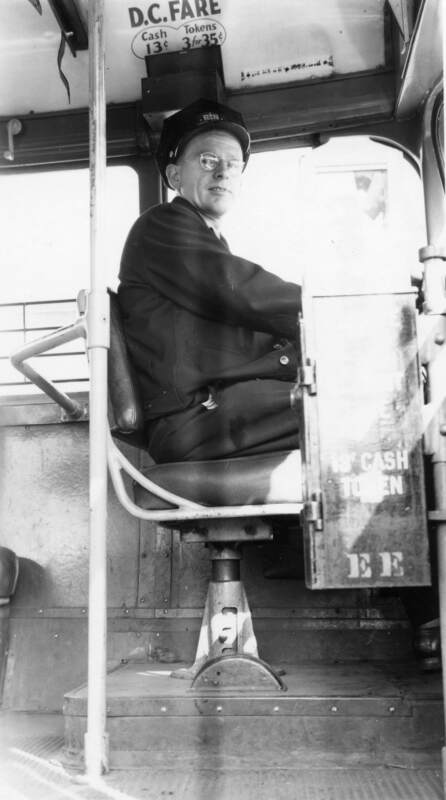 He was a streetcar operator and later supervison for Capitol Transit and a devoted and very sharing railfan.